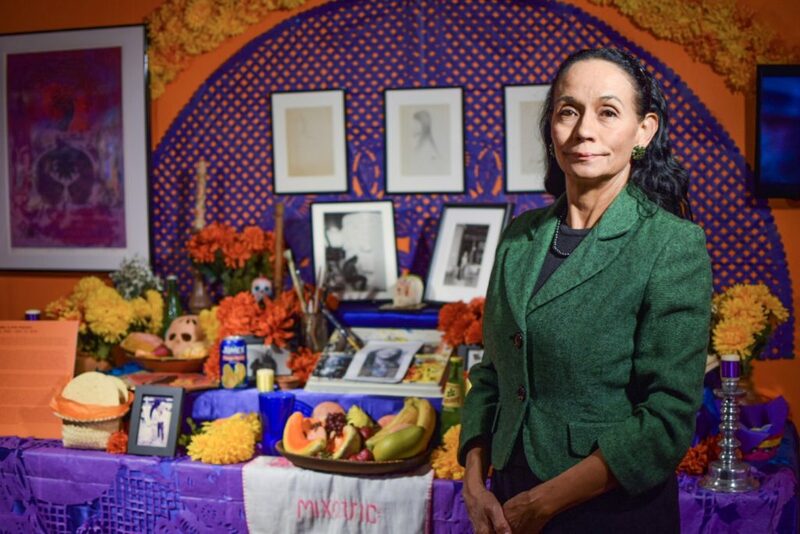 Thirty-four years ago, the Mexic-Arte Museum’s annual Día de los Muertos celebration was small enough to fit inside the main gallery of their 300-square-foot warehouse. Now, the Austin-based Latino art museum easily attracts thousands of participants from across the state, coming together to celebrate, discover, or put their own twist on the holiday. Each year, this culminates in the museum’s Viva la Vida parade in downtown Austin coupled with a months-long altar exhibit. This year’s altars are on display at the museum until Nov. 25. When Sylvia Orozco, BFA ’78, first came to study art at The University of Texas, the Mexic-Arte co-founder was one of only a handful of Latinos in the department. At the time, fine arts museums and courses didn’t often focus on Latino artists, so Orozco felt compelled to find a way to include them in the narrative. She joined several Latino art and activist student organizations, meeting up with fellow artist and future Mexic-Arte co-founder Sam Coronado, BFA ’75, at the Chicano Art Student Association. After leaving UT, she pursued her master’s at the National Autonomous University of Mexico. She lived in Mexico City for five years, working alongside artist Pio Pulido to found a small art school in the suburbs of the city. There, they began building a foundation for the future of Mexic-Arte, collecting prints, photos, and other art pieces donated by local artists. They eventually moved to Austin together in 1983 and Orozco told Coronado of their plans to create a museum dedicated to Mexican art and culture. It wasn’t the first time someone had attempted the venture, but Orozco, Coronado, and Pulido were determined to make it stick. Their very first event was centered around Día de los Muertos. At a time when it wasn’t as well-known in the U.S., the celebration and exhibit were meant to expose Austin to a holiday with indigenous Mexican roots. Typically celebrated on Nov. 2, the holiday is a time when families honor lost loved ones and entice them to visit by creating altars or ofrendas for them. Along with traditional elements like marigold flowers and copal incense, families also include photos, keepsakes, and the favorite foods and drinks of their loved ones to welcome them into their homes. Orozco grew up in Cuero, Texas, a small town about an hour and a half southeast of San Antonio. Though she grew up in a Latino household, her family didn’t celebrate Día de los Muertos, so it wasn’t until she lived in Mexico that Orozco witnessed her first day of the dead in Mixquic. The small town outside of Mexico City is known for its day of the dead celebration, which spans three days and brings together the whole community. Orozco has been back to the small town a few times since her first visit, and still, the celebration continues to amaze her. After her experience in Mixquic, Orozco knew Día de los Muertos was an important tradition she wanted to bring back to Austin. She saw how the celebration combined Mexican culture and history, but also art and creativity. Rebecca Gomez, the exhibit curator, said the museum tries to incorporate the traditional elements of the holiday with more contemporary motifs and events. For example, following the popularity of Coco, she wanted the exhibit to incorporate the brightly colored creatures called alebrijes that are featured in the film. The exhibit also includes an altar to the victims of the volcanic eruption in Guatemala earlier this year, and another dedicated to the Colunga family who participated with their lowriders in the city’s first Día de los Muertos parade. But for Gomez, her favorite altar this year is one of Celia Delgado, BS ’53, who died earlier this year. Gomez felt she deserved to be honored because she graduated from the College of Pharmacy at a time when there were few Latinas. Even now, with an altar decorated with burnt orange memorabilia, Gomez says people who stop by often recognize her. “A lot of our altars are dedicated to famous people, and even though Celia was also a family friend, I thought it was important to include her because of how much she gave back to the community,” Gomez says. Psychology junior Bianca Vasquez has celebrated Día de los Muertos with her family in Houston for years. But after moving to Austin to study at UT, she was looking for a way to celebrate away from home. For the past two years, she’s attended Mexic-Arte’s celebration with friends. It’s that community that Orozco envisioned when she and her co-founders set out to achieve during their first Día de los Muertos celebration. Over the years, as awareness in day of the dead has become a part of popular culture, Orozco has seen people adopting and adapting the celebration in their own lives.